First up is this beautiful Vegetarian Japanese Curry (1) from Green Gourmet Giraffe which brings together Asian and Oriental flavours. If you’re making it the traditional way, you use a Japanese Oriental curry powder but if this is hard to find, you can, as Johanna does in her recipe, use an Indian curry powder instead. This recipe also features grated apple, Worcestershire sauce and even apricot jam. I am so intrigued by the flavour combinations in this curry, I simply have to try it. Brinjal aka aubergine aka eggplant is one of my favourite vegetables and this Stuffed Eggplant (2) from Thou Shalt Cook definitely has my name all over it. And a great new way for me to put my garam masala to good use too. This brilliantly vibrant Southwestern Avocado Scramble Salad (3) from The Taste Space features classic spicing for a real taste of the US Southwest, along with peppers, carrots, black beans, lettuce and of course avocado. Nutritional yeast is an ingredient I’ve never come across before. Will need to investigate that one… Slow cooked lamb is a particular favourite of mine (see below) and this Slow Cooked Lamb Ras el Hanout (4) from Farmersgirl Kitchen is simply divine. Doesn’t that lamb look just so wonderful succulent and tender? It’s most definitely got my name writ large all over it. You might recognise these Middle Eastern Spiced Camp Fire Chickpeas (5) from Elizabeth’s Kitchen Diary from a previous Spice Trail round-up, but I’m so glad Elizabeth has shared them again as they are perfect for this latest challenge. The chickpeas are spiced with Elizabeth’s favourite blend of spices, sub-ah b’har, also known as a seven spice mix, a staple in any Middle Eastern kitchen, and cooked al fresco over a Nordic Fire Log. I want to go camping this summer just so I cook this up. While Jane from Onions and Paper admits her ‘Moroccan’ Spiced Chicken Crown with Lots of Lovely Veg (6) might not be totally authentic, the overall effect is still reminiscent of much Moroccan and other North African cuisine. Authentic or not, featuring both ras-el-hanout and harissa paste, I reckon it looks incredibly tasty. It’s so simple too and all cooked in one pan, saving on the old washing up. Win-win in my eyes. Chef Mel has come up with her own spice blend for her Spiced Chicken with Stir Fried Thai Jasmine Rice (7) using dried Kashmiri chilli, fennel and caraway seeds. Mel boasts its better than anything you’ll eat in a Chinese or Thai restaurant and I believe her. It’s packed full of big, fresh, vibrant flavours – just what you want for a quick and easy weekday supper. I do enjoy a good dhal but I don’t seem to cook it at home nearly enough. This Red Lentil, Sweet Potato and Spinach Dhal (8) from Eating, Enhanced is a recipe I’ll be trying out on my family very soon, featuring my favourite Indian spice blend garam masala. It’s also a great way to use up vegetables lurking in the fridge nearly ‘on the turn’. Allotment2Kitchen’s recipes are always so inventive and this Ethiopian Eritrean Inspired Zigni Vegetable Broth (9) is a case in point. The recipe comes from Celia Brook‘s World Vegetarian Classics and has been adapted to use spinach and sweet potatoes instead of the more traditional pumpkin or squash, along with a fiery Berbere Hot Spice Blend which Shaheen made from scratch. I could easily eat a big bowl of this, and undoubtedly be up for seconds. Did I mention how much I like slow cooked lamb? I mean really, really, really slow cooked lamb, as in overnight. My entry for The Spice Trail is this Overnight Roast Shoulder of Lamb with Ras-el-hanout (10), which is perfect for the Aga and just the job for a big family feast. For those of you not happy to end a meal without a pudding, you’ll be pleased to hear that we received a couple of sweet entries too. How about one of these pretty Speculaas Spiced Cupcakes (11) from I’d Much Rather Bake Than…, proof that Laura can actually bake things that don’t contain chocolate! I love the speculaas spice mix, in fact I’m rather addicted, so I think I’d find it hard to stop at just the one… Lastly De Tout Coeur Limousin brings us this splendid Spiced Tea Loaf (12), spiced with quatre-épices, a blend of allspice, nutmeg, clove, ginger and pepper. It just happens to be fat-free and low-sugar to boot, providing a virtuous finale to our spicy menu. As ever there can only be one winner. I’m very pleased I didn’t have to make that decision, handing the responsibility over to Julia Latif at Our House of Spice. 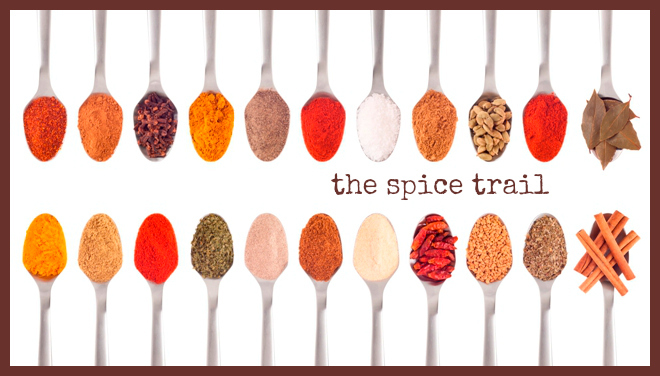 Julia says, “The Spice Trail has showcased a fantastic range of dishes from cupcakes to curries with each recipe bringing us together from around the globe by portraying our love and passion for good quality and tasty cuisine. “It was so difficult to pick a winner but I’ve chosen Eating, Enhanced’s wonderful Red Lentil, Sweet Potato and Spinach Dhal because it is so quick, simple, healthy and delicious!” Our winner will receive a fabulous Indian spice selection from Our House of Spice, including spice kits for masala curry, tarka dhal, baked chicken, Bombay potatoes and raita. 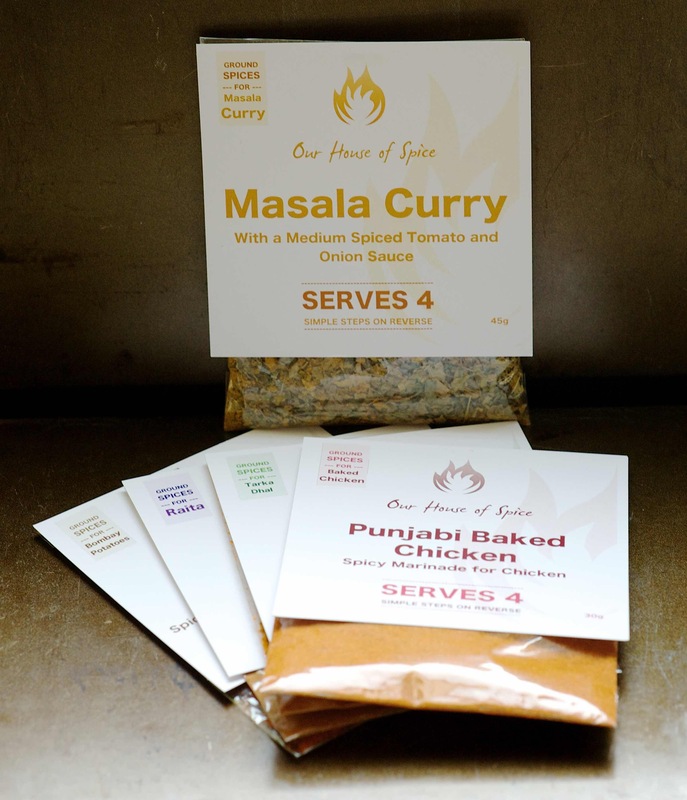 I’ve tried the tarka dhal and baked chicken kits and they are absolutely brilliant. Congratulations to Eating, Enhanced on her win and huge thanks to everyone that took part in this Spice Trail challenge, and for Julia at Our House of Spice for judging and providing such a great prize. The theme for the next challenge will be announced very soon.